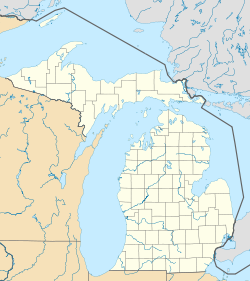 Livonia is a city in the northwest part of Wayne County in the U.S. state of Michigan. It is a large suburb with an array of traditional neighborhoods (most of which were built in the 1950s and 1960s) connected to the metropolitan area by freeways. The population was 96,942 at the 2010 census, making it Michigan's ninth largest municipality. The municipality is a part of Metro Detroit, and is located approximately 15 miles (24 km) northwest of downtown Detroit, and less than two miles (3 km) from the western city limits of Detroit (Redford Township lies between the two). First settled by pioneers from New England and New York, an act by the Legislature of the Territory of Michigan established the borders of Livonia Township on March 17, 1835. The settlers brought with them the name "Livonia", a name that had already been given to Livonia, New York, Livonia, Pennsylvania and a region on the eastern shores of the Baltic Sea named Livonia in present-day Estonia and Latvia, from which many early settlers came. Livonia Township was split off from Nankin Township, in which a Livonia post office had been established in June 1834. Livonia was incorporated into a city on May 23, 1950, by vote of the citizens of the township. A significant motivation was to gain tax revenues from the DRC (Detroit Race Course), which was Michigan's only thoroughbred horse race track; it closed in 1998. Six U.S. presidents have visited the city: Richard Nixon, Gerald Ford, Ronald Reagan, George H. W. Bush, Bill Clinton and George W. Bush. According to the United States Census Bureau, the city has a total area of 35.86 square miles (92.88 km2), of which 35.70 square miles (92.46 km2) is land and 0.16 square miles (0.41 km2) is water. By 1985, and as of 2005, there is a group of Christian Palestinian Americans, many of whom operated small and medium-sized businesses, who originated from Ramallah. As of the census of 2010, there were 96,942 people, 38,714 households, and 26,856 families residing in the city. The population density was 2,715.5 inhabitants per square mile (1,048.5/km2). There were 40,401 housing units at an average density of 1,131.7 per square mile (437.0/km2). The racial makeup of the city was 92.0% White, 3.4% African American, 0.2% Native American, 2.5% Asian, 0.4% from other races, and 1.4% from two or more races. Hispanic or Latino people of any race were 2.5% of the population. There were 38,714 households of which 29.1% had children under the age of 18 living with them, 55.9% were married couples living together, 9.7% had a female householder with no husband present, 3.8% had a male householder with no wife present, and 30.6% were non-families. Of all households 26.7% were made up of individuals and 13.1% had someone living alone who was 65 years of age or older. The average household size was 2.47 and the average family size was 3.01. As of the census of 2000, there were 100,545 people, 38,089 households, and 28,071 families residing in the city. The population density was 2,815.0 per square mile (1,086.8/km2). There were 38,658 housing units at an average density of 1,082.3 per square mile (417.9/km2). The racial makeup of the city was 95.45% White, 0.95% African American, 0.22% Native American, 1.94% Asian, 0.01% Pacific Islander, 0.32% from other races, and 1.11% from two or more races. Hispanic or Latino people of any race were 1.72% of the population. 16.3% were of Polish, 15.9% German, 11.2% Irish, 8.6% Italian and 8.5% English ancestry according to Census 2000. Livonia has a substantial Middle Eastern population mostly Arab and trace their ancestry to the Levant region, mainly from Syria, Jordan, Palestine, and Lebanon, and are of the Christian faith. The Arab-American community has few churches in the city, Mainly Saint Mary's Antiochian Orthodox Christian Church. The community settled in Livonia in the late 1960s and has since continued a steady growth. There were 38,089 households out of which 32.5% had children under the age of 18 living with them, 62.8% were married couples living together, 8.0% had a female householder with no husband present, and 26.3% were non-families. Of all households 22.9% were made up of individuals and 11.1% had someone living alone who was 65 years of age or older. The average household size was 2.59 and the average family size was 3.07. In the city, the population was spread out with 23.8% under the age of 18, 6.3% was from 18 to 24, 28.7% was from 25 to 44, 24.3% was from 45 to 64, and 16.9% were 65 years of age or older. The median age was 40 years. For every 100 females, there were 94.0 males. For every 100 females age 18 and over, there were 90.8 males. In addition to its schools, colleges, churches, parks, recreation center, libraries and the St. Mary Mercy Hospital, Livonia also has commercial and industrial sectors, restaurants and retail stores. Laurel Park Place, an upscale fashion mall with 74 stores, was built in 1989 at 6 Mile Road and Newburgh Road. Carson's and Von Maur department stores serve as anchors. The city previously featured two other malls which have since been dismantled. Wonderland Mall was the first, opening in 1959 and closing in 2003; it was replaced with a development called Wonderland Village, anchored by Walmart and Target. Livonia Mall was built to the north in 1964. It also closed in 2008 and was redeveloped as Livonia Marketplace, featuring a second Walmart, along with Sears and Kohl's. Other big-box stores are located near Laurel Park Place. Livonia is home to the Livonia Hockey Association, the largest amateur hockey association in Michigan, as well as two-time state champions the Livonia Knights. The city also boasts the Livonia City Soccer Club, one of the largest soccer programs in the state, with 1,300 participants. Livonia's mayor is Dennis K. Wright. The city is located in Michigan's 11th congressional district. Livonia is in Michigan's 7th State Senate District, and is represented by Dayna Polehanki (Democrat). Most of Livonia makes up Michigan's 19th State House District which elected Laurie Pohutsky (Democrat) in 2018. A part of southeast Livonia is in the 11th district which is represented by, Jewell Jones (Democrat). Various private and public colleges and universities are located in Livonia, including Madonna University, Schoolcraft College, and a small University of Phoenix campus. The most recent university to open in Livonia is a Davenport University campus, which opened in 2008. Most of Livonia is served by the Livonia Public Schools district, consisting of two early childhood centers, thirteen elementary schools, four upper elementary Schools, three middle schools and three high schools. The district also serves students in portions of Westland. A portion of northeast Livonia is served by the Clarenceville School District. There are currently five high schools in Livonia, four of which are public: Franklin, Churchill and Stevenson high schools in the Livonia Public Schools district; Clarenceville High School in the Clarenceville Public School District; and Ladywood High School, a Catholic all-girls private school run by the Felician Sisters. Bentley High School, the first one built in the district, closed in 1985. Each high school in the Livonia Public School District offers a different educational program. Stevenson High School is the home of the school of Global Education, an alternative education model which combines students' English and social studies classes with a focus on the student's role in the world. Churchill houses the MSC (Math/Science/Computer) and CAPA (Creative and Performing Arts) programs. Franklin currently offers an International Baccalaureate program for select students. Frost Middle School houses the Middle School Alternative Classrooms for the Academically Talented (MACAT) program. The public K-6 Webster Elementary School is home to the Alternative Classrooms for the Academically Talented (ACAT) program, as well as many after-school programs. Webster also has classes for disabled children. In 2008, the original Webster school was burned down by an arsonist, and Webster was moved to a closed-down school, Tyler Elementary. MSC (Math, Science, Computers) a program for the academically gifted housed at Churchill High School. Peace Lutheran School (Pre-K-8) and St. Paul's Lutheran School (Pre-K-8) are affiliated with the Wisconsin Evangelical Lutheran Synod. The Metro Detroit–area newspapers are the Detroit Free Press and The Detroit News. The Livonia Observer is printed twice a week, on Thursdays and Sundays. The newspaper Between the Lines and the website PrideSource are headquartered in Livonia. ^ "Population of Michigan Cities, Villages, Townships, and Remainders of Townships 2000–2009" (PDF). Michigan Department of Technology, Management, and Budget / CSSTP. ^ City of Livonia.History[permanent dead link].Retrieved on January 11, 2009. ^ MacGregor, David (2005). "Introduction". Livonia: Michigan. Charleston, SC: Arcadia Publishing. pp. 7–8. ISBN 0-7385-3425-0. Retrieved 2008-11-25. ^ "President Bush's Visit - Beaver Aerospace & Defense". beaver-online.com. ^ Present Tense, Volumes 13–15. American Jewish Committee, 1985. p. 36. "Palestinian Christians, in the western suburbs of Farmington, Livonia and Westland;"
^ Bureau, U.S. Census. "American FactFinder - Results". factfinder.census.gov. Retrieved 29 March 2018. ^ "Leading Employers in Livonia (May 2017)". Livonia Chamber of Commerce. Retrieved 24 May 2018. ^ "Hours and Locations Archived 2010-03-27 at the Wayback Machine." Livonia Public Library. Retrieved on March 29, 2010. ^ "Characteristics of creative thinking psychology". www.starringcapa.com. Retrieved 29 March 2018. ^ "Observer and Eccentric Livonia Observer". HometownLife. Retrieved 29 March 2018. ^ "About Us Archived 2014-04-27 at the Wayback Machine". PrideSource. Retrieved on April 14, 2014. "Mailing address Pride Source Media Group Between The Lines Newspaper 20222 Farmington Road Livonia, Michigan 48152"
^ "Nationwide Poll Reveals Top U.S. and Canadian Speed Traps" (PDF). National Motorists Association. August 28, 2012. Archived from the original (PDF) on October 19, 2012. ^ Merrill, Elizabeth (August 22, 2008). "Taormina takes solace in knowing she didn't quit on her Olympic dream". ESPN. Retrieved March 19, 2011. Wikivoyage has a travel guide for Livonia. Wikimedia Commons has media related to Livonia, Michigan.